The purpose of the study was to evaluate the efficacy and safety of vitamin D3 at 4000 IU/day as a treatment option for aromatase inhibitor-associated musculoskeletal symptoms (AIMSS) when compared with the usual care dose of 600 IU D3. We conducted a single site randomized, double-blind, phase 3 clinical trial in women with AIMSS comparing change in symptoms, reproductive hormones and AI pharmacokinetics. 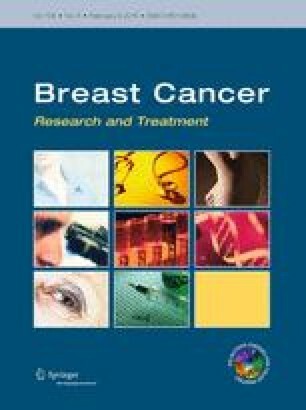 Postmenopausal women ≥18 years with stages I–IIIA breast cancer, taking AI and experiencing AIMSS [breast cancer prevention trial symptom scale-musculoskeletal (BCPT-MS) subscale ≥1.5] were admitted. Following randomization, 116 patients had a run-in period of 1 month on 600 IU D3, then began the randomized assignment to either 600 IU D3 (n = 56) or 4000 IU D3 (n = 57) daily for 6 months. The primary endpoint was a change in AIMSS from baseline (after 1 month run-in) on the BCPT-MS (general MS pain, joint pain, muscle stiffness, range for each question: 0 = not at all to 4 = extremely). Groups had no statistically significant differences demographically or clinically. There were no discernable differences between the randomly allocated treatment groups at 6 months in measures of AIMSS, pharmacokinetics of anastrozole and letrozole, serum levels of reproductive hormones, or adverse events. We found no significant changes in AIMSS measures between women who took 4000 IU D3 daily compared with 600 IU D3. The 4000 IU D3 did not adversely affect reproductive hormone levels or the steady state pharmacokinetics of anastrozole or letrozole. In both groups, serum 25(OH)D remained in the recommended range for bone health (≥30 ng/mL) and safety (<50 ng/mL). The study was registered in Clinical Trials.gov (NCT01509079) and conducted under IND #114046. Trial Registration clinicaltrials.gov, identifier: NCT01509079. An erratum to this article can be found at http://dx.doi.org/10.1007/s10549-016-3818-8. Many thanks to the study participants who made this trial possible. We also wish to thank Karen Zwicky, Lori Strayer, Jeremiah Menk, Marilyn Magadan, Elsie Anderson, Amber Egan, Niki Hoese, MaryJo Nissen, Karen Swenson, Michaela Tsai, Frank Stanczyk and Stan Patel, Roxanne Grayes, and the clinical laboratory staff at Methodist Hospital. Research relating to this analysis was co-funded by Grants from the National Cancer Institute and the National Institutes of Health Office of Dietary Supplements (R21 CA149934) and the Park Nicollet Institute and Park Nicollet Foundation. This work was supported in part by NIHP30CA77598, using the following University of Minnesota Masonic Cancer Center Resource: Clinical Pharmacology and the National Center for Advancing Translational Sciences (NCATS) of the National Institutes of Health (NIH UL1TR000114). No conflicts of interest reported by any of the authors. All procedures performed in studies involving human participants were in accordance with the Ethical Standards of the Institutional and/or National Research Committee and with the 1964 Helsinki Declaration and its later amendments or comparable ethical standards. Informed consent was obtained from all individual participants for whom identifying information is included in this article.